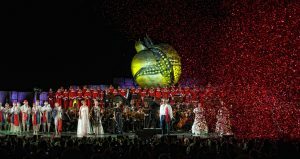 Teatro del Silenzio 2019 – The best offers to the event! 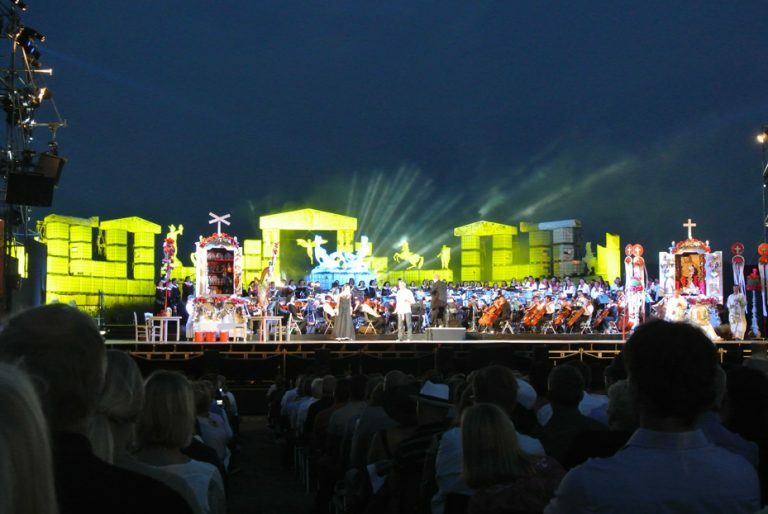 “Ali di libertà” is the title of the 14th edition of the Teatro del Silenzio. In the past editions our tour operator Arianna & Friends took over 6,900 people to the yearly event. Enquire about our Teatro del Silenzio 2019 – The best offers to the event! WHEN WILL THE 2019 EVENT BE ANNOUNCED? 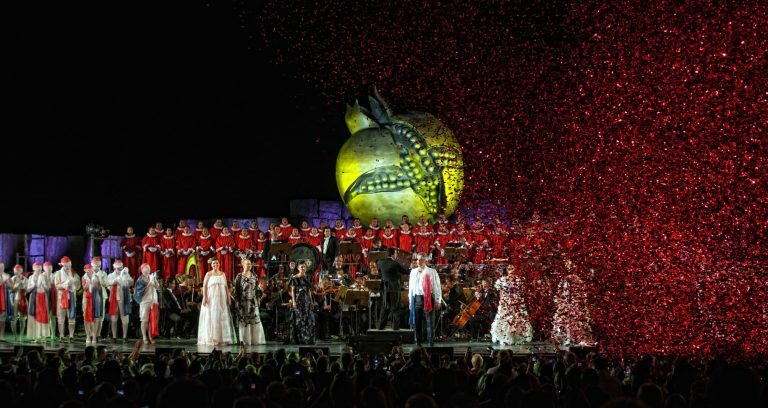 THE 2019 EDITION OF TEATRO DEL SILENZIO WITH ANDREA BOCELLI WAS ANNOUNCED ON 17th October 2018. IS THERE A SEATING CHART OF THE ARENA? WHO IS ARIANNA & FRIENDS? 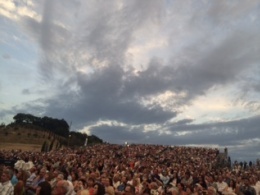 at Teatro del Silenzio for over 7,500 people. 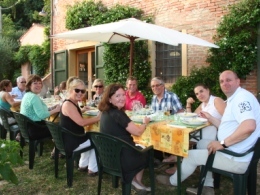 Arianna & Friends is located in La Rosa di Terricciola, only 7 kms from Lajatico and from Teatro del Silenzio. The tour operator and destination management company Arianna & Friends was established in 2007. It was a great experience and a wonderful occasion to visit Tuscany for many people from all over the world. Read the feedbacks of our guests here or visit our Tripadvisor page. WHERE IS TEATRO DEL SILENZIO? Teatro del Silenzio is an open air arena just outsite of Lajatico, a small village in Tuscany, 45 kms from Pisa and 95 kms from Florence. Access to the arena requires a 15 minutes walk down a little hill along a pedestrian pathway. Please, note that the recommended airports to get to the venue are Pisa Airport (45 kms) and Florence Airport (95 kms). The closest railway station is Pontedera on the Pisa-Firenze line. HOW CAN I GET TO TEATRO DEL SILENZIO? 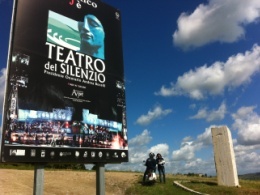 Teatro del Silenzio is NOT easy to reach since the area gets usually blocked due to the heavy traffic related to the event. Private cars are forced to park in a little town 3 km before Lajatico and people need to queue to take public shuttle buses to Lajatico and the arena. The same takes place after the end of the event and queues continue for long time. The easiest and most comfortable way to get to Lajatico without losing time in the traffic jam is by booking seats in our chauffeured cars, minivans and minibuses. Our shared minibus services and our private chauffeured car services are allowed to reach Lajatico downtown. You will get off directly at the entrance of the pedestrian pathway leading to Teatro del Silenzio. On the day of the concert, we organize minivan/minibus/coach transfer services from Pisa, Florence and the many other places in Tuscany. Our minibus collects you at a convenient place in town and drives you to Teatro del Silenzio. Our service is the easiest and most comfortable way to get to Lajatico without stress. If you want to book your seats on our minivans, minibuses or coaches contact us now! On the day of the concert, we organize private chauffeured car transfer services from Pisa, Florence and any other place in Tuscany. Our professional drivers collect you at your premises and drive you to Teatro del Silenzio. Our service is the easiest and most exclusive way to get to Lajatico. If you want to book your seats on our cars or minivans contact us now! In order to get to Lajatico from Pisa or Florence you can take a train to Pontedera, i.e. the closest railway station to Lajatico, just 24 kms away. Pontedera is on the Florence-Pisa line. Here you can check the Italian Railway timetable. From Pontedera you can reach Lajatico by taxi or by bus. Here you can check the Local Bus Company timetable. The bus service stops before 9 pm and the last train service runs at around 1:30 am in Pontedera. Taxis cost around 50 Euro one way from Pontedera railway station to Lajatico. There is a limited number of taxis serving from Lajatico on the way back. Often taxi drivers do not get to Lajatico late at night after the event to take the last visitors who need a service. We do not recommend this solution. If you drive a car from Pisa take the freeway FI-PI-LI in the direction of Florence. If you drive from Florence take the freeway FI-PI-LI in the direction of Pisa. In any case get to the exit Pontedera. Here follow the signs to Volterra. After about 23 kms you reach the small village La Sterza where the concert organization is arranging a huge parking area. From La Sterza you can take a shuttle bus service to the theater and back. It is advisable to get to the parking area at least a couple of hours in advance due to highly possible congestion problems on the road to Lajatico. Lajatico is a small village in the countryside between Pisa and Volterra. You can get there by rented car or using our comfortable transfer services. Public transport is instead very poor and taxi do not work on the way back. CAN I PURCHASE TICKETS ONLY WITH YOU? OUR TICKETS ARE NOT AVAILABLE FOR INDIVIDUAL SALES ONLY BUT EXCLUSIVELY COMBINED WITH OUR SERVICE of accommodation packages and/or transfers. We only sell tickets in our packages for the sectors EXECUTIVE, POLTRONISSIMA, PRIMA POLTRONA and SECONDA POLTRONA. The Executive and Poltronissima tickets are the ones that we sell out faster. We sell tickets at their face price and only associated with the services of our offers. CAN I BUY TICKETS ONLINE AND THEN BUY TRANSFERS AND/OR ACCOMMODATION WITH YOU? Of course! We are very happy to organize all logistics for you after you have bought your tickets online or from other operators. 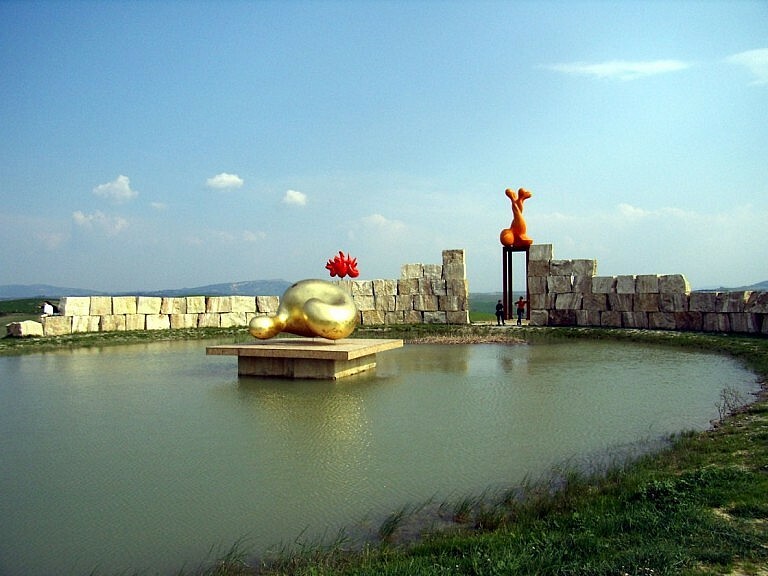 We provide transfers to Teatro del Silenzio, as well as from and to any airport of Tuscany to any destination as well as the best accommodation offers for a comfortable stay. PLEASE DO NOT BUY TICKETS OUTSIDE OF THE OFFICIAL CIRCUITS! WE OFTEN FIND OURSELVES HELPING PEOPLE LAST MINUTE AFTER THEY WERE FRAUDED ONLINE! HOW CAN I STAY INFORMED ON THE EVENTS AT TEATRO DEL SILENZIO EVERY YEAR? 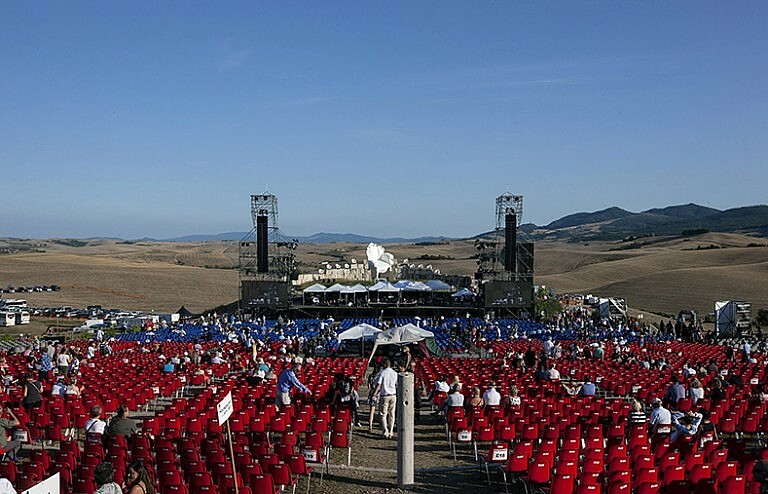 If you subscribe to our ANDREA BOCELLI CONCERT NEWSLETTER we can keep you informed about all editions of Andrea Bocelli’s concerts at Teatro del Silenzio in the future. WHAT LANGUAGE DO THEY SPEAK IN LAJATICO? Lajatico is located in the province of Pisa, in Tuscany, part of Italy. The only language spoken there is Italian with an amusing and coloured local Tuscan accent. Young people and tour operators speak or understand English. For any help, Arianna & Friends is available for language assistance. We cover English, German, French, Spanish and Russian. IS THERE ASSISTANCE FOR IMPAIRED PEOPLE? The organization of the concert – City Sound Milano – arranges special services for people with impedements who cannot walk independently. Please, contact them directly as they are the only ones able to arrange such a service. As Ross is so tall, could one of the seats be on the aisle side -the other one next to it and as centre to the stage as possible. At this stage we are not certain of accommodation, but could you please pass on your options We look forward to your instruction. So nice to hear from you. Garry and I were just talking yesterday about Andrea Bocelli festival and how busy you and the crew must be – sounds like a big success! We talked about coming back and enjoying this event in the future with our friends. Again thank you so much – take the much deserved rest. Thank you for the recipes, can’t wait to try them again – each time it will bring beautiful memories of Tuscany and Arianna and Friends! Just would like you to know, our trip to Tuscany was a great experience ! from being met at the airport and everything following on from that. Very friendly & helpful staff at the lovely hotel Armenia & of course the spectacular concert in the Tuscany hills, from all the artistes. Unfortunately I left my programme of the concert at the hotel & wondered if you have an email address for them so I can enquire if they would possibly post it to me, I will reimburse the cost . We would just like to say how much we enjoyed our trip to Florence and the Andrea Bocelli in Latajico. It was absolutely amazing and our seats were fantastic. We think we may like to experience Il Teatro di Silencio again and would be most grateful if you could let me know when a date has been set for next year. We thank you all for your help arranging a wonderful trip for us. Just to say a big thank you for a job so well done on Thursday for the concert at Lajatico. My husband and I had a fantastic time and you made it all seem so much easier. I wouldn’t have liked to have done it without your organisation. I was just wondering if you know whether or not official DVDs of the concert will be available and if so where I could get one from. our thanks for all the wonderful organisation which gave us such a smooth event. As you know the concert was superb and the new members of our group als had an outstanding time. Please pass on our thanks to your colleagues and make sure we are top of your mailing list for the event next year as we definitely want to return to Il Mulinaccio and to see the Maestro again. Happy 70th Birthday Jennifer and signed by him. So all in all I was able to make her wish come true hanks to you. Please convey my profound thanks and appreciation to all your team. Could you please let me know how much a transfer from our accommodation in Florence to Pisa airport would cost? Thank you I really wish we could take you out for dinner. However if you ever want to visit England you have an open invitation to come as stay with us. You have my phon numbers just call and leave the rest to me. 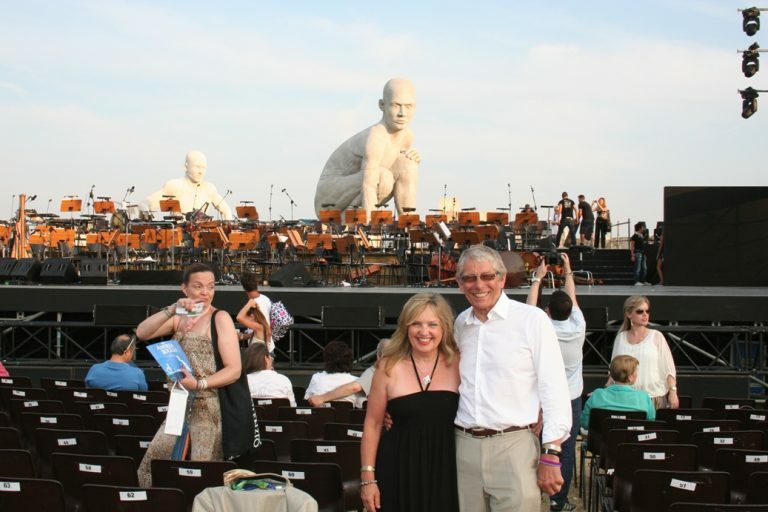 A short note to say how much we enjoyed our trip to Tuscany and the Andrea Bocelli concert . From our initial pick-up at Pisa to our final journey back to the airport all stages of the trip were well organised and most enjoyable. Hotel SM was a good base and Paola and his family made us very welcome. We managed to fit in a full day in Pisa and then Florence (by train) but of course the highlight of the.trip was the concert itself. Arianna & Friends made what .could have been a stressful and demanding excursion very comfortable and manageable. We will definitely be using your services again, most probably in 2018 when I have a “big birthday”! I will be in touch with you.nearer the.time, but meanwhile thanks.again for helping make.our trip so memorable, and I will be certain to recommend your services to my friends. Megan W. & Colin. Wilmslow, Cheshire UK. 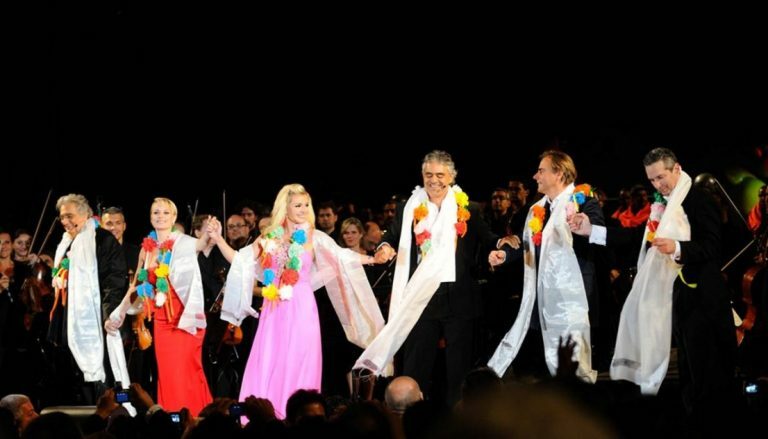 Finally my dream came true on July 30 and I saw Andrea Bocelli at Teatro Del Silenzio. I waited that day a long time and it was amazing to be under the Tuscan sky, listening to his velvet voice I can’t still believe I had the opportunity to hear him singing live! He is definitely the best in the world! I want to thank you you are really so professional everything was perfect I was on the car number 3 we were 5 people and our driver was so kind, good he informed us in every point (sorry I cant remember his name) I met Argentine couple and I liked them so much along the way we talked to each other. Shortly I am so glad I choosed you. It’s nearly two weeks since we returned from Tuscany and our wonderful stay there and I apologise that it has taken so long to write to you since our return. We were very surprised to receive your kind gift of the alabaster fruit bowl and bottle of wine just before our departure along with the enclosed note and I would like to say that the only issue that we had during the whole journey to and from Lajatico was having to listen to one extremely rude and grumpy client of yours (sadly English!) who was presumably the person who complained about the delay to the concert. Actually even though it took us quite a while to get there we were in plenty of time to enjoy the village, the entry to the concert ground and the concert itself so we were somewhat surprised that he had complained at all. We are sorry that you felt the need to apologise. From our perspective there was really no need. We had a wonderful cooking class on the Friday with Luca (I think I have spelt that wrong!) which we all thoroughly enjoyed and June and I also enjoyed every minute of the concert from start to finish. I am sure with all such events, sometimes things take longer and do not always go to plan but considering how many people you had to look after, I think you did an excellent job. Many thanks for all your efforts on our behalf. We are now back in Holland for a week, and are still enjoying and re-living every moment of the trip to Tuscany! Thankyou so so much for the perfect organisation !!!! From the time that Diego picked us up at the airport on the 27th, til the moment that he brought us back in to the departure lounge, every single event was planned and executed to perfection. A deep bow and hat off for you and your organisation. Friday 29th with Massimo to Vinci , visiting the Leonardo Museum with dedicated guide, the on to wine tasting, ordered some wine for shipping to Holland, then onwards to Florence, with a great dinner reservation at the square, perfect! Saturday morning again wine tasting in San Miniato, just beautiful day! In evening The Concert!!! Le Cirque!!! and to top it off to the house of Andrea Bocelli for a late dinner to close a perfect evening. The sons of Andrea came to our table and sang a happy Birthday song for Aunt Henny! She was so impressed…..
Nest day we went back to the airport, still feeling in heaven…..a trip to never forget. thank you thank you Veronica, love from all the four of us! If we can do anything to promote you or you need references, I can recommend you and your company to anyone who wants to travel to Tuscany and need advise to organise a private chauffeur driven fun-packed holiday suitable for all ages! 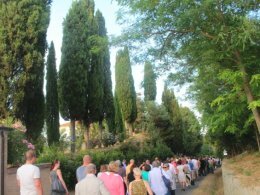 We just wanted to say thank you so much for the wonderful organisation for our recent trip to Tuscany and the magnificent Andrea Bocelli concert. It was unforgettable!! 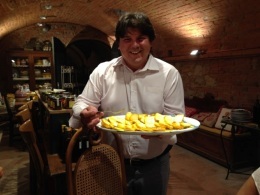 The accommodation and food at Agriturismo was lovely and Alessio the perfect host. Please keep us on your mailing list as we would like to return next year. I want to thank you and your company for arranging the fantastic time we had in Tuscany. The Maestro was amazing, of course, but Le Cirque was much more of an extravaganza than we could have imagined. How did they get all those performers, animals and special effects up to that little town? Hard to believe. It was wonderful – a once-in-a-lifetime experience – and we enjoyed it very much. Perhaps they will offer the show on DVD. My only negative comment is with regard to the start time. I don’t think it’s reasonable to advertise an 8:15pm start time and then not begin until almost 9:30. Perhaps this is something the organizers can improve on next time. Again thanks for all your help and hospitality. 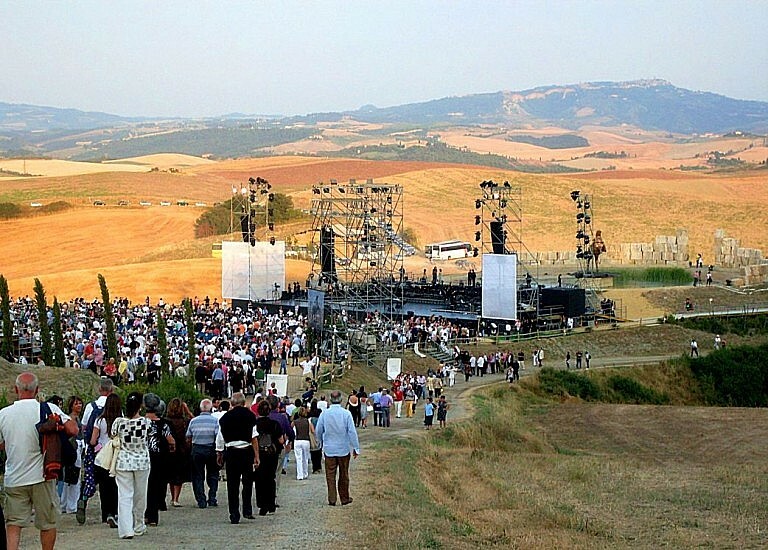 I do hope we will get to experience another Bocelli concert at Teatro del Silenzio sometime in the future. 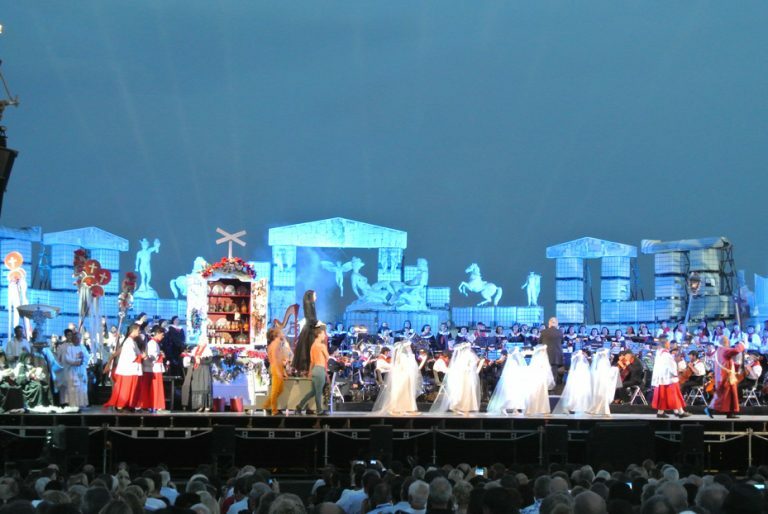 This is an email we received on 7th August 2016: ... everything went like clockwork..
We wanted to let you know how much we enjoyed the Andrea Bocelli concert at Lajatico; it doesn’t seem possible that a whole week has gone by! We are sorry not to have met you personally on the night of the concert, as some from our hotel did, but we are so grateful for all of your meticulous planning. Everything went like clockwork, San Gimignano and the hotel La Cisterna were both stunning, and a special commendation to the driver who collected and took us back to Pisa airport. You made a special occasion for us into an exceptionaly special occasion. Cara Veronica, cari amici toscani, buon giorno Ancora una volta grazie per averci dato la possibilità di assistere ad uno spettacolo unico, bellissimo, in un posto magico quale è il teatro del silenzio, con la voce super di Andrea Bocelli e dei suoi ospiti. Grazie anche per gli hotel dove siamo state trattate benissimo, le stanze veramente ampie e confortevoli. Grazie anche per gli omaggi che ci avete fatto. Many apologies for the lateness of this thank you email but I would just like to offer my sincere thanks to you and the team for the transfer arrangements you provided for the Andrea B concert in July. I know that there were a number of disgruntled passengers on the Volterra coach who made life difficult for you but in my opinion their complaints were not justified. You all did you best and in my opinion met the promise you made for the transfer. Safely home now. We had a great time in Lajatico last week and thoroughly enjoyed the Concert. I just wanted to thank you for your help and general assistance in making things work out so well for us – all much appreciated. As a matter of interest, is it worth booking hotels through you next time we want to be in Italy? I would like to express our appreciation of the way you handled our transportation and accommodation requirements. Absolutely first class. This years performance at the Teatro was magnificent, at the same high but on a different level that last years performance. Just a short note to thank you for organising for me this wonderful experience. I am sorry that it has taken me a while to write formally but I do want to record my thanks to you all for another successful and wonderful evening in Lajatico (both rehearsal and concert) this year. I am aware that some people were disappointed in the content and, indeed we had no idea that the format would be different to what we have come to accept from Andrea in concert, but to see Cavalleria Rusticana performed was special and we would not have missed if for the world. Many many thanks once again. Firstly I would like to apologise for taking so long to send you all this email. Our time in your beautiful region of Tuscany was truly fantastic, the five days just went so quickly. Our accommodation was lovely, Alessandro and his team made us welcome and very soon after arriving we felt we were among friends. 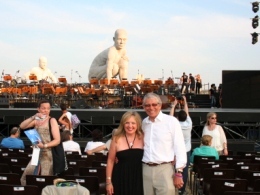 Now for the concert……..what can I say about such a beautiful venue under the stars and the wonderful Andrea Bocelli. It was a truly memorable evening with the additional surprise of the great Placido Domingo and the fantastic seats that we both had. We will definately be back, and a big thank you once again for organising it all so well. Just to thank you for all the assistance and wonderful time we’ve spent there. We’re considering the possibility of returning there next year for the concert so, please keep me in the mailing list. Well, the 2014 Concert is over and we are back home and back to work. The Concert, as expected, was incredible, even though it was very different from Andrea’s usual concerts, but the weather was great by the time the concert started and the seats were great. Our seats were not as good as last year but, nevertheless, they were great – maybe next time we can get tickets a little more to the center. All of the rest of the package you prepared for us was also excellent. We stayed in Volterra and we loved it there. Volterra is a very beautiful area of Tuscany and we truly enjoyed the tour of the vinyard and winery. Everything was exactly as you told us it would be. In fact, Tony and I so loved Volterra, that we are already talking about next year. Andrea’s Facebook page says they are already working on next year’s concert and as soon as all papers & contracts are signed, they will announce the date. If you get that date first, please keep us in mind as we would like to make our plans with you again. Thanks very much and we hope to hear from you. Ancora una volta vi debbo ringraziare per averci dato la possibilità di assistere ad un concerto unico e irripetibile in un luogo magico, nonostante la pioggia caduta copiosa prima del concerto. L’hotel di San Gimignano lo conscevamo già e, come lo scorso anno, ci siamo trovate bene tra gente cordiale e disponibile in un paese bello e vivibile, tranquillo, per lo meno dentro le antiche mura. Jeff and I wish to thank you all for our wonderful trip to Tuscany. Your friendly efficiency made our whole trip one that we will never forget. 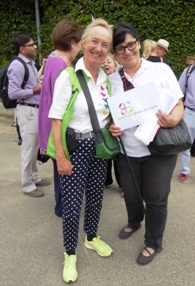 It was such a pleasure to meet you in person Arianna – on our pasta factory tour and olive farm lunch – your enthusiasm was refreshing and contagious – photos attached as promised. We met some amazing people – all who had booked through your company, and were singing your praises. The concert was truly a “somewhere over the rainbow” experience! I just wanted to send you all a well deserved THANK YOU for you help and service for my trip to Italy and the Andrea Bocelli concert. The Armonia Hotel and staff were delightful. Everything was so well organised. I overheard many comments from other guests that had booked with you who felt the same. Your service and care made it possible for me to be able to travel alone with my mobility issues and I thank you most sincerely. If I am able to return to Italy I will certainly be booking with you. nun sind wir wieder Zuhause und das schöne Konzert klingt immernoch nach!! Wir waren sehr glücklich mit unseren guten Platzkarten und dem charmanten und schönen Hotel San Lino in Volterra! Nochmals ganz herzlichen Dank für alles. In der anlage ein kleines Foto vom Abend . willingness to jump in and help. the area’s foods and customs, not to mention wines is impressive and much appreciated by Sue and I.
Congratulations for the work you all do. Just want to thank you for the most amazing experience. It was truly fantastic trip and your organization of everything was so helpful. Dear Massimo, here are a few great pix from our pizza making class at Aldo’s. Thank you all for everything! 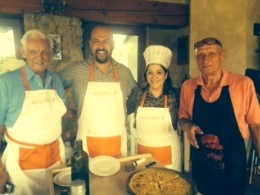 I had a fantastic time at Bagni di Pisa, the Bocelli concert and the wonderful pizza making class at Aldo’s in the beautiful Tuscan countryside! Sending my love to you all! Love your style, efficiency, responsiveness to any communication, etc. And of course, your wonderful spirits! Everything has been very smooth ! I am back home now. Thank you to you and your team for your hospitality. Just a reminder to process the credit. Thanks. Susan wrote to you this morning but I would like to add my thanks and it would seem that you and other tour operators have had an influence and the new people who took over the Teatro del Silenzio management this year did a wonderful job.The environment was happy even party like with picnics and bottles of wine popping during the early evening and everybody was relaxed and in a good mood. If you have the contacts please thank those concerned who helped make this a wonderful evening in Lajatico. How do we thank you enough??? We arrived home and the opportunity to see Andrea Bocelli again at Lajatico was even better than we could have ever expected. It is you and your teams attention to detail that makes it so very special. The professionalism, the care, the efficiency, the friendliness gave the evening a party atmosphere to all. No detail was overlooked.It cannot get easier for us .Perfect hotel, good food with great staff !!! Easy transport to the venue and timely return !!! Helpful on site Arianna team staff who looked after us so well. As for ‘Il Maestro’ riding past us on horseback at the end of the evening was the ‘cherry on the cake’.What world super star takes time to be with his fans in such a way ??? You can book us in for next year. Once again thank you and your whole team for perfection. We would like to thank you for the good organization. We had a wonderful trip. The apartment was on a good location, transportation to the concert was super, a good English speaking driver, the reception with snacks and drinks was very nice and above all; we enjoyed the opera and Andrea. We are very enthusiastic!!! We love to come next year. Would you please send me an email when the tickets go on sale. We would like to add our thanks and appreciation to Arianna and Friends for their expert organisation of this holiday for us. This was our third visit to Lajatico, but our first with Arianna and Friends. We were impressed by the communications that kept us up to date before we left home, and enjoyed the dinner on the first evening in San Gimignano very much. It was a good idea to bring some of us together in advance of the concert, and lovely to find a table reserved for us and everything taken care of, including the bill! We liked the low-key feel of this holiday, which left us the freedom to do as we liked, but the organisation was there when it mattered most, for the concert evening. We were surprised to see how many people were coming with Arianna and Friends. Being in many different hotels and accommodations, you tended to think there would just be a few of us on the night. How wrong can you be? The seats were fantastic, thank you: brilliant view of the stage, and the concert was as magical as always. These are the memories we shall cherish for ever. And how reassuring it was to find your people at staging posts to direct us back to our buses at the end. I see lots of people have voiced their concerns about the 90 minute wait to get in, and am heartened to see Arianna has raised it with the organisers. When you consider how long it takes for all those people to get in, queue for the loos, buy programmes and souvenirs, food and drink, and then find your seat, we could have all been in our seats in half the time if they had let us in sooner. And what worries me is that once people realise there is no point standing in a queue, they go off and visit Lajatico etc., coming back much later to avoid the queue, thereby prolonging the start of the concert some more. Another year it could be 10pm before it starts. We would really appreciate a more efficient access system so hope you have the chance to point this out to the organisers. But all in all, it was wonderful. 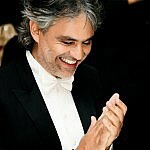 For me there is nothing to match Andrea Bocelli’s singing. He has the power to take you out of all life’s problems and send you soaring above it all. We do hope we can come again next year with Arianna and Friends. I have a few photos to share with you. I hope you will enjoy them as much as I do. Thank you for all of the great tours and assistance and organisation of my holiday in Tuscany. I had a very enjoyable time! You are all great! I made a pizza and foccacia today with Aldo’s recipe and the ingredients that I bought in Italy and Presto! they turned out good! Thanks for the great pizza making class at Aldo’s. It was so much fun as were all the other tours! Thanks a lot for perfect bus transfer service. I’m afraid we did not have a hotel room or a breakfast. Maybe another customer is waiting for your receipt. Please check. We don’t need any receipt. Thank you for the transfers to see Andrea Bocelli. We were very impressed with the organisation, especially as we were picked up from our hotel. It was easy to find someone from Adrianna and friends if we needed help. I was a travel agent for over 30years and retired as a shop manager for Thomas Cook last December. My friend still works for them as a travel consultant and we shall have no problem recommending you friends and family. Just a quick line to express our appreciation for the excellent arrangement for our trip to the concert. Everything went extremely well, from our pick-up at the airport (an excellent driver and very courteous), to the arrangements on the night itself. Our intention at this point in time, is to return for the event next year and were wondering if you ran a mailing list, informing clients of the opportunity to book well in advance. I would be pleased to hear from you if this is something you offer. Finally, I have only one criticism, which pertains to the hotel side of the trip. We were attracted to this particular hotel because it offered access to a swimming pool. However, when we arrived we were informed that the pool was not in service, a seasonal closure. We were told that we could use it if we wished, but on inspection it was obvious that the water wasn’t circulating and looked quite cloudy. I do think that we should have been made aware of this before we travelled and then given the option of an alternative hotel. That said, I repeat that we remain very impressed with the attention to detail given by your operation. We say a big thank you for the organisation for Bocelli. What a beautiful evening although the queue was long and the concert started late. It was a very special experience for my wife and I. We had originally seen the Vivere concert on TV which inspired us to come. Tuscany is such a wonderful place and the Hotel and people in Chianni deserve a special mention. We will be back in Italy soon. thank you, we were delighted with the transport and would use your service in the future…just have to get tickets for the next concert now! Thank you very much. We did indeed enjoy our stay very much. And will sure return in the future. Thank you so much for suggesting the truffle tour on Monday 15th – we had a brilliant time and managed to find 4 truffles! The occasion was amazing and Lucca truly inspiring with his little dog. Thank you also for the organisation of the concert tour from San Gimignano to Lajatico, the bus was totally organised it is a shame the same cannot be said about the wait for the concert! thank you very much for the receipt. Our time in Tuscany was great. Thank you very much for your brilliant organisation and care. I tried to find the list of the accommodations/packages at your homepage, that you offered for this year’s concert, but guess you have removed it, as the event has passed. Still, is there any chance that you could send me the list of the accommodation packages that you offered this year or at least the list of the accommodations that you had a deal with, so I can do some selection upfront (though it would be nice to know the price and period of the various packages as well). Now that we are home safely, we just wanted to thank you all for the wonderful time we had in Tuscany last week – all the arrangements were perfect, the Andrea Bocelli concert was one of our most memorable evenings ever, and the hospitality of Guiseppe and his family at Fabbiana superb. We had never been to Tuscany in sunflower season – how beautiful it is. In this day of the internet, I know that clients can sometimes be extra cautious so if you ever wish to receive a reference from us, please do not hesitate to contact us. It will be “shining” like the Tuscan sun! I have only just returned home yesterday evening and just now have read your email. Thank you for your concern. Yes, Angela and Marco are correct, the passenger was very aggressive and his behaviour was uncalled for. Unfortunately, people like that do spoil events for the rest of us. I actually was more concerned for your staff as it was a difficult situation for them to handle and they did very well. Angela remained quiet and Marco parked the bus as he dropped us off and walked away from him and tried to remain calm. They were both very professional and I could see they were concerned for us and eachother. I was worried for them too and could sympathize with their situation. He was very annoying and his swearing and yelling were unpleasant. It is not your fault. He was also seated next to me in the concert. Lucky me! If I could only be so lucky in a lottery! He also made comments during the concert, he didn’t like that “opera sh..”, and why couldn’t Andrea sing some of the other songs on his cd’s which weren’t opera! Besides that, the woman on the other side of me decided it was a good time for snacks and started crunching on potatoe chips in my ear as Andrea was singing some beautiful songs or singing along with him! ugh!! It is of course not your fault nor your organization’s. People’s behaviour is not something you can predict or control. They should be more considerate of others around them. The air conditioning on the bus was just fine. I was comfortable and it was already past midnight so it wasn’t too hot outside. He just wanted to be difficult. He even swore at the women who got off the bus to exchange thier vouchers for tickets. He was obnoxious about everything! As it turned out all of us girls walked back to the hotel together and shut the elevator door on him so he had to wait! After all is said and done, my evening was not spoiled. On the contrary, it was a beautiful evening and the concert was spectacular. Your staff were so kind to me, all of them, every day and every place or on every tour which I took. They all treated me so kindly and I was really pleased with the service they provided. The vans were also very nice and the drivers drove safely and cautiously and were always alert at the wheel. Thank you for taking such good care of me. The hotel in San Miniato was very good and really gave us a good welcome dinner and apero. They too were very kind to me. Additionally, my extended stay in the Villa was also very pleasant. The pool in the hot weather was terrific! They had a bottle of Andrea Bocelli wine which I was able to purchase before I left and will try it on a special occasion. The location of the concert was not a problem for me, not with your assistance. I was happy to be able to go to the concert and could not have gotten there without you. I have wanted to come for many years but was worried because I know it is not located easily in a location where public transportation is available and since I do not have a car or know the area have shyed away from coming. However, you have shown me that it is possible and I would very much like to come again. If my job and good health remain I will contact Arianna and Friends again next year to arrange all the details and assist me once more. It was my first time to Tuscany and it is a beautiful region. I would love to visit again! I had a wonderful time! I have not yet downloaded my photos but will send you a few as soon as I do for you all to enjoy. Thank you to you and your staff. My holiday in Tuscany will be a very memorable experience. You guys are truly fantastic! Thank you for making our night so wonderful. We could not have done it without your company. You guys are truly fantastic! Hi Veronica and everyone !! Just wanted to say a very big ‘Thank you’ for helping us with our booking and our stay in Tuscany. We had an amazing time, our hotel, transfers, concert tickets….everything was so well organised we just wanted to thank all of your team. It was so lovely to meet Arianna and all of the team on the night of the concert, you are all so lovely and it was great to meet you all in person, thank you so much. We didn’t know what to expect but everything worked out perfectly, our only regret is that we didn’t stay longer, 4 days wasn’t enough but the trip was wonderful and we want to do it all again next year ! We found the concert quite emotional, Andrea is such a brilliant performer and the setting was perfect, our only comment was that the gates didn’t open early enough and we all had to wait in the heat for too long, perhaps next year they will do things differently. It was so nice to meet you in person last weekend. I just wanted to drop you a note to say thank you so much for organising everything, we had a perfectly wonderful time; Andrea’s concert was brilliant and staying at Fattoria Giuseppe was fantastic; we had a lovely time there and were able to celebrate our wedding anniversary weekend in a really special and memorable way. Thank you and your wonderful team again. It is hard to believe that it is now a week since we were in Lajatico! It was wonderful and I just want to say thankyou to you, Veronica, Conseula, Massimo and everyone who helped to make the trip a lasting memory. I hope that we will be able to come again in 2014. We would like to thank you for helping us have the most wonderful few days of our lives to celebrate 40 years of marriage. The hotel package at Villa Bianca was superb from the welcome we received from Antonio and staff to the room, the food & concert buffet, swimming pool and the grounds and your arrangements which all went like clockwork. The tickets you obtained for the concert were absolutely in the right place and the transport arrangements were excellent including the careful driver. We enjoyed the concert even more than we thought possible – what a beautiful performance all round in such a marvellous setting in the Theatre of Silence – just an experience of a lifetime. We even learnt to walk like happy penguins on the way out!!! The farm cookery course with Mrs Bocelli and Arianna was really good fun, great location & kitchen and the meal outside afterwards was very tasty!!! We learnt a lot of things and have already used our new knowledge and enhanced our Italian cuisine. We have attached a couple of pictures. We have already recommended you to some friends who want to visit Tuscany and hope we can meet with you again in the future. I have written separately to thank you for organizing a very special holiday in Tuscany. I wondered however whether you have had any feedback from the concert ? If you are able to feed back to the organizers I think they should be aware of the problems caused by the significant delay in the start of the concert and the delay in opening the gates. It was most unpleasant and uncomfortable queuing in the lanes for over an hour and a half. At the end of the concert there was also a problem which prevented a smooth exit which caused difficulties. Given the distances people had travelled, and we met people from the Caribbean, it would have been nice for guests to be welcomed in English. Overall however the concert was a very special experience. Note: Our Tour Operator Arianna & Friends has protested with the organizers of the concert, the company CitySound from Milan. We really hope that this bad management of the event by the organization will not happen again. Dont worry about the uneducated person of a single case.We are happy and understand how hard it is for you to arrange and coordinate this event.Was great and thanks for your professionalism. See you next time. Keep me on your mailing list for all your future events. to thank you for a smooth trip with the transfers accommodation ect . Please pass on my email to Diana as we didn’t see her before we left and would like to thank her for her help during our stay. We don’t normally do packages, we normally like to travel independently and make our own arrangements, so we were a little apprehensive. However we felt at once that we were in safe hands with your excellent communication and friendliness from the start of the booking process right through to our arrival in Tuscany. We topped this off with the fantastic cooking experience on Sunday, which was such fun. Your staff are all terrific and still managed to be smiling and happy after such a hectic weekend. We hope you are all having a well deserved rest now. P.S. How do we go about getting the recipes from our cookery lesson ? Are they on your website ? We just want to say a huge thank you to all of you for arranging the most memorable birthday ever! Veronica, it was so good to meet you and your colleagues on Saturday, and we are all unanimous in saying that the concert was simply amazing! We were all enthralled from beginning to end, and quite definitely it was the best concert that I have ever attended. The venue is unique, and the stage effects and orchestra from Geneva wonderful. Andrea was superb as was the whole of the supporting performers….. and the sound! Wow! Bocelli sounded better in the flesh than any recording, as did the other artists. I could rave for hours, but rest assured that it was a concert that will live in our hearts forever! I have to also tell you that our seats were superb so again thank you for your recommendation. The icing on the cake was the encores… I was longing to hear Time to say goodbye and Nessen Dorma, and he sang both. It was a tear jerker! We also have to thank you for your attention to detail. The hotel was superb, the staff and food wonderful! We love Antonio…. our new best friend. Also Francesca. The planning was all superb and everything went completely without a hitch. We adored our day in Florence, and thank you for organising that. Our guide was delightful and we saw so much in a short time, yet it was relaxed and very, very informative. We also made some good friends staying at the hotel. Truthfully, it was like a private house party, with some really lovely people, all going to the concert. Of course we had much to talk about on Sunday! You can imagine. We shall most certainly book with you again, maybe the cookery course or truffle hunting, but we were thrilled that what we chose was exactly right for us. We could come back to the hotel, and relax by the pool and swim after Florence, and also after walking to Gambassi..
We had good flights both ways, with Easyjet, both on time, and on arrival our son Rob and his lovely wife Linda, drove us to Gambassi with no problems. We have already told people in the flight queue about you and we shall continue to sing your praises to anyone who will listen hehe!. Our Best wishes to you once again. I will definitely recommend you to everyone I know! > I have just heard from my Mum and Auntie who are safely back in the UK. > They were overcome with how wonderful everything was and wanted me to pass on their enormous thanks to you!! > and all the help at the concert from yourselves of course! > I would also like to thank you for making everything so easy to organize – I will definitely recommend you to everyone I know! Just a quick note to say a BIG thank you for arranging a hassle free transfer to the Andrea Bocelli concert last Saturday evening, we had an absolutely magical evening thanks to all of you that helped along the way! 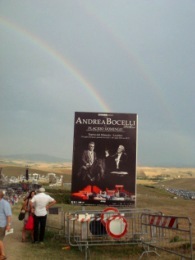 Thank you for everything you did to make our sixth visit to see Andrea Bocelli (Il Maestro) at Lajatico so wonderful. It seems that each year you improve the service your team provides.A great hotel in a perfect location, a good welcome meal and pre concert food.For us everything was brilliant!!! Please thank your whole team for the superb efforts they took on our behalf .Everything was so easy and left us nothing to worry about. We shall see you next year and look forward to yet another fabulous time. We have just returned to London after a great experience in Tuscany, staying in San Gimignano and attending the Andrea Bocelli concert. Thank you very much for organising this for us, it was a great success and we will have no hesitation in recommending you to friends. Best wishes, Jane and Tom B. Would you add me to your mailing list for next years concert? Can I just say a big ‘thank you’ to you all for your great organisation. Altough we have now almost six months from Bocelli’s show show, I need to compliment you for the organization for the show. It was a great time and Tuscany is wonderful. The landscapes, the people, the small cities we normally only see in films and found they really exists, this will never be forgotten. The remaining of the trip to Firenze and Milan was fine. I loved Firenze. For sure will try in the future be back in Tuscany. Please congratulate all in Arianna & Friends and hoe see you again in Italy or Brazil, who knows?